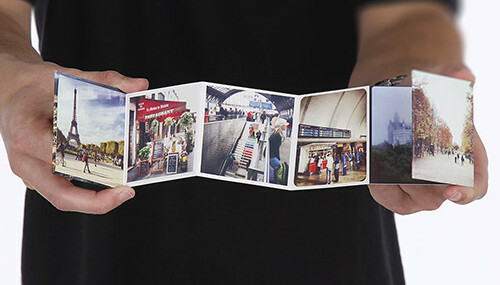 The PresentAccordion is a 75mm square booklet with 10 pages and a personalised cover. These little booklets are printed in high resolution with matt laminated hard covers on either end. Compact enough to carry anywhere, it can open like a mini-book or the 75mm accordion unfolds to a 450mm wide view. Each PresentAccordion allows space for 10 square images (the first 6 on one side and 4 on the other + a hard personalised cover on either end) - images can also overlap the squares allowing for panoramic images OR multiple images can be placed on each page.